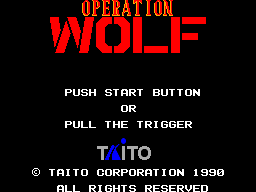 Operation Wolf is an arcade game released by Taito in 1987. It was ported by Taito and published by Sega for the Sega Master System. Operation Wolf is a shooting game which makes use of the Light Phaser peripheral, however it can also be played by moving a cursor around the screen with a Control Pad. Players will take control of former Green Beret-turned-Mercenary Roy Adams who is hired by US Government to save five US citizens who are taken hostage by the new communist government of fictional South American country named Cherigo. Unwilling to repeat the failure at "Taran" (obviously a reference to Vietnam), US President (who looks suspiciously like Ronald Reagan) decides to sent a mercenary instead of sending the regular army. In the European Master System manual, all references to United States is removed. US is replaced by another fictional country named "Carmea" and player is sent to rescue former "pro-Carmean" president of Cherigo and Carmean embassy staff. Interestingly, Master System version uses cover art for the sequel, "Operation Thunderbolt". Adams' partner Hardy Jones can be seen in the cover art. Completing this level will lower the amount of enemies player will face in the subsequent levels. Completing this level will reveal the location of the Prison Camp, which is normally not accessible at the beginning of the game. Helicopters are replaced with Patrol Boats in this level. Completing this level will recover a large number of health. Completing this level will refill the both ammunation and rocket supply. Primary objective. During this level, five hostages will attempt to cross the battle field. If they can reach leftmost part of the screen, they will be considered rescued. Saving the hostages is NOT necessary to finish the game but every dead hostage will lower the overall score at the end of the game. Final Mission. Players will attempt to survive as hostages from previous levels will now attempt to reach the US Air Force transport plane on the left side of the screen. At the end of the level, a Mi-24 Hind attack helicopter will attack and players must shoot the heavily armed and armored helicopter to finish the game. In addition to these levels above, player will be ambushed by Cherigo's anti-partisan forces randomly once between the levels. Power ups can be acquired by shooting them. Recovery Drink This pep drink will recover 5 blocks of health. Dynamite Not exactly a power up, shooting this dynamite will cause an explosion that will kill anything nearby. Useful for destroying tanks. "FREE" Bullet This power up will give player unlimited ammunation for a short time. Enemy Infantry Cherigo maintains a small and somewhat poorly trained infantry force. Many enemy soldiers can be killed with a single shot. Paratroopers Cherigan Airborne forces appearently trained in the ways of firing their weapons while landing with a parachute. Artillerymen These troops will throw grenades at you. Grenades can be shoot while they are in the air. Handgunners These "brave" (read: stupid) troops will appear in front of you and shoot you from the close range with their pistols. Special Forces These gray-clad elite troops will roll around, making them harder to hit. They also take two hits to kill. Executioners These soldiers will attempt to kill the hostages with the knives they are carrying. They must not be allowed to reach hostages. They pose no threat to the player. Russian Soldiers "Advisors" from Soviet Union, these large, blonde soldiers wear body armor and can only be killed with head shots. They spray the player with light machineguns that can cause serious damage. They only appear in Ammo Dump level. BRDM-2 "Tanks" Even though manual calls them tanks, these are 4W armored vehicles with machinegun turrets. While not as much as a serious threat to the player compared to the helicopters, they can still cause significant damage. MD 500 Helicopters Either purchased by previous Pro-US government of Cherigo, or perhaps unlicensed North Korean copies, these fast and suprisingly well armored helicopters will swoop down from the air and spray the player with bullets. They are biggest threat players will face. Patrol Boats In the Jungle level, helicopters are replaced with these fast boats. They are easier to destroy compared to the helicopters. Trucks These 6W truck are not a threat to the player and only there for points. Mi-24 Hind A gift from Soviet Union to their new Cherigan allies, this flying monster will be the final enemy player will face. Its 12.7mm machinegun can kill player within seconds. Main article: Operation Wolf/Magazine articles. NEC Retro has more information related to Operation Wolf.